Our Pointers are very important to us. They are just as much a part of the family as they are anything else…they enjoy plenty of couch and bed time, and love being the center of anyones attention! Pointers are active dogs, designed to go all day non-stop in the fields hunting birds, and then come back home and curl up in front of the fireplace to rest for the next days hunt. Our experiences with Pointers have taught us that for the most part, while they are constantly moving outside, whether chasing squirrels from tree to tree or keeping the yard free from birds and other small animals, they are fairly content to just lay around on fluffy dog beds or couches for most of the day inside. There are exceptions to every general rule, and there are some that are very high energy and cant seem to calm themselves down enough to just relax indoors, and there are others who could care less about being outdoors or being active at all. I believe the latter type lacks overall breed type and drive, as they are missing that “wide awake, hard driving hunting dog” part of the general description of what makes a Pointer a Pointer! I’ve been asked “Why Pointers?” It is an especially interesting question to be asked, because there are some days, I just dont know! I was initially drawn to the breed based on their looks. I had the chance to see quite a few nice ones being shown, and the more I got to know them, the more I fell in love with not only the grace and beauty of the breed, but their overall demeanor and temperament as well. This is a breed that is loving and sweet to the core. A breed that loves its family, as well as its friends, and there are many dogs in the breed that would crawl under your skin and never leave if given the chance. We always joke that you will never do anything alone again in your life if you have a Pointer – nothing is sacred. You have an audience while cooking dinner, doing dishes or laundry, you will have an audience while going to the bathroom, and taking a shower. Pointers love to be with their people. They have their quirks – Pointers are not a breed for everyone. They can be hard headed, they can be hyperactive, they can care less about coming back to you every single time you call. They have legs, they have STRONG muscles, and they can RUN! A Pointer can be out of hearing range before you even think you might need to recall them. 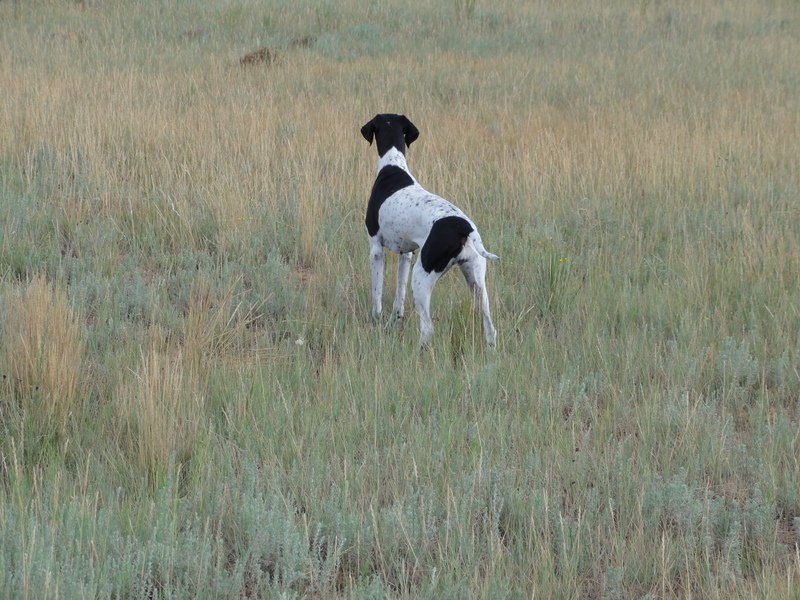 Training from day one of getting your Pointer is vital to the future of the dog. Teaching a Pointer puppy to pay attention to you is much easier than trying to teach a Pointer adult to pay attention! Going back to the “Pointers are not Goldens or Labs” scenario – the same goes for training. Pointers can not be drilled, and many will not happily do whatever you ask just because you ask it. Pointers like to do things their own way, and often there is little else you can do but laugh and go along with it. There are a number of successful obedience and agilty Pointers in the world, but their owners work hard and laugh a lot during the road to training success with their dogs. The rewards, however, are a well trained, beautiful dog that is a model citizen and a fantastic family member. At the end of the day, the Pointer is still a bird dog, and there are few sights as breathtaking as watching a handsome Pointer do what it was bred to do – hunt birds. With modern society and advances in the way we find food and put it on the table, the Pointer has “lost its job” in many homes, as they are not required to go hunting to bring home the family dinner any longer. (While, I’m quite certain some are still used in that fashion, but the overwhelming majority of them now are simply pets) While my idea of a great weekend does not involve tromping through muddy fields in search of birds with my dogs, I think maintaining the natural abilities of the dogs is vital. At the end of the day, we enjoy living with this unique breed, and enjoy sharing them with the world. Come find us at a show or event we will be attending, and come meet the Pointers. We love to tell people about this wonderful breed, and share one of the great secrets of the dog world with others.